Featuring a crystalline top and a stunning metal finish. 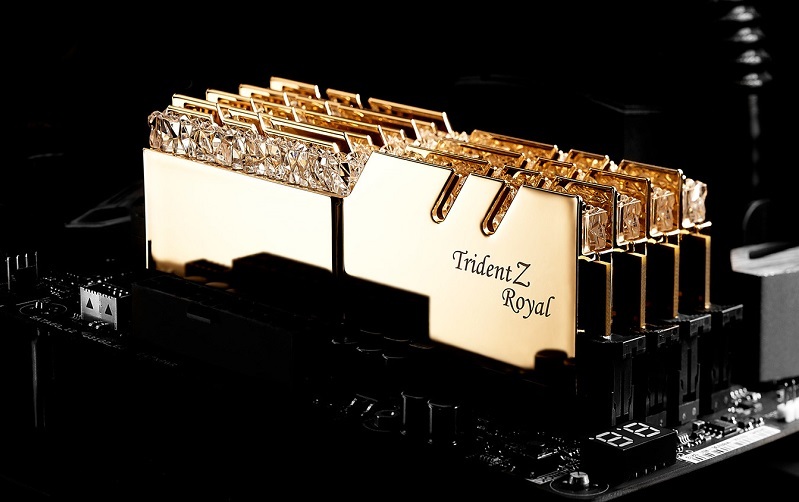 Read more about G.Skill's Trident Z Royal DDR4 memory kits. It's quite nice in the silver/platinum but the gold ewww. It reminds me of a Persian restaurant. Don't like the font used either. This is the sort of thing that will do well in Dubai etc. I actually LIKE the gold, LOL! At least it's a bit different. In the proper color-coordinated build, gold looks amazing. It's been done to death dude. I have seen loads of mods where people have gold plated components. I just don't like it, personally. The silver with no writing on I could deal with but the gold meh. The only time I have ever seen it was on a build some guy did with an Aztec theme. It really did work (kinda reminded me of the pyramids). Other than that? yeah, I will pass thanks. That was Snef's Egyptian-themed build, and was the exact build I was thinking of when I said I like the gold. It has to be done RIGHT, and it's very easy to do it tacky and wrong. Yeah, and every other one I have seen looked awful lmao. You're right, though, it was Snef's. Incrediballs ! The Gold look a zillion times better than the Silver.